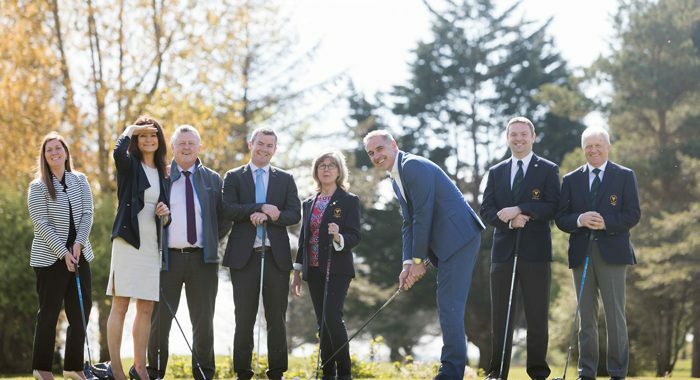 Pictured at the launch of Shannon Chamber’s 2018 Golf Classic (from left): Louise O’Hara, Park Inn by Radisson Shannon Airport; Helen Downes, CEO Shannon Chamber; John Sinnott, Ei Electronics; Damian Flaherty, Irish Life Health; Patricia Enright, lady captain, Shannon Golf Club; Niall Harris, Morgan McKinley, main sponsor; Jim O’Grady, captain and Pat McCarthy, president, Shannon Golf Club. Photo: Eamon Ward. With summer making a welcome appearance, Shannon Chamber members are taking to the practice ranges to ready themselves for their annual outing on the fairways of Shannon Golf Club to partake in Shannon Chamber’s golf classic. This year’s event takes place on Midsummer’s Day, 21 June and so eager are members to participate that all tee slots have already been filled. Delighted with the response by members and their guests to partake in the classic, Shannon Chamber’s chief executive, Helen Downes described it as a great endorsement for the event. “We would love to accommodate more teams but, despite the extended daylight hours at midsummer, we have been allocated a full day’s timesheet and cannot extend the slots or we would be playing until midnight. We can, however, accommodate a few additional tee sponsorships for companies who wish to be associated with the event. As always, refreshments on the 12th will be provided by the Park Inn by Radisson, Shannon Airport and a steak dinner and lots of valuable prizes will be the players’ reward at the end of the day, thanks to the generosity of numerous prize sponsors. For more information on how to become involved with Shannon Chamber’s 2018 Golf Classic, as a tee sponsor or prize giver, call Lijana at 061 475854.